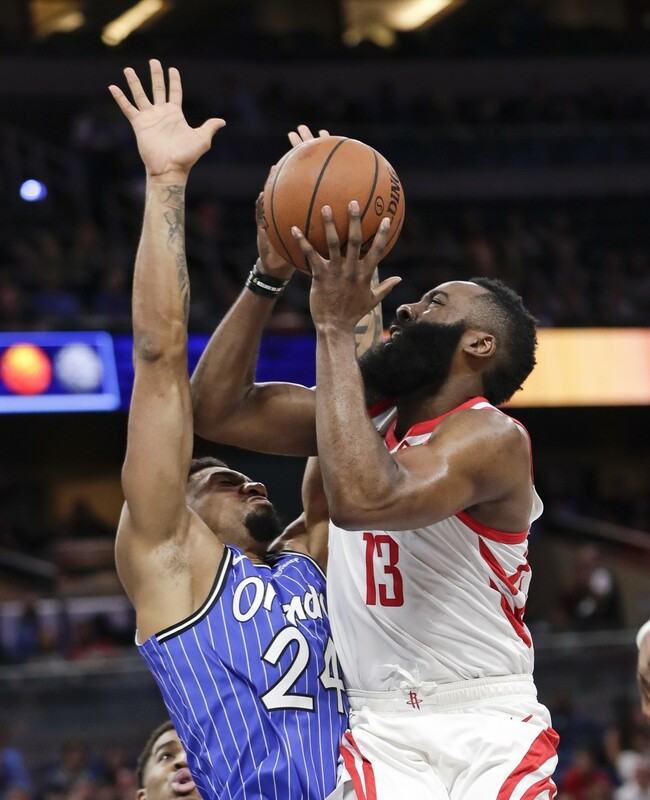 Harden scored 38 points Sunday night in Houston's 116-109 loss in Orlando, marking the 16th consecutive time that he's scored at least 30 or more points — matching Kobe Bryant for the league's longest such streak since the NBA-ABA merger in 1976-77. But Harden also was 1 for 17 from 3-point range, tying the league's single-game record for most misses from beyond the arc. "They just didn't go in," Harden shrugged afterward. The NBA's greatest shooters have had awful nights from 3-point range — Dennis Scott once went 2 for 17, Ray Allen once went 1 for 14, Stephen Curry has an 0 for 11 game on his resume. Harden went 0 for 11 from deep in Game 5 of last year's Western Conference finals against Golden State, and has been 0 for 10 on three other occasions. Houston coach Mike D'Antoni didn't pin the loss on Harden's shooting. He blamed the Rockets' defense, and Harden concurred. "The problem is, you can't rely on him being superhuman every night," D'Antoni said. "We've got to have some contributions from other guys. I just thought they came in with a lack of focus, particularly on the defensive end." Bryant scored 30 or more in 16 straight games from Jan. 29 through Feb. 28, 2003. If Harden scores at least 30 in his next game — that should be Monday against Memphis, assuming he's in the Rockets' lineup — he would top that mark. The last time an NBA player had a longer streak than that was in the 1963-64 season, when Wilt Chamberlain had 20 straight games scoring 30 or more. 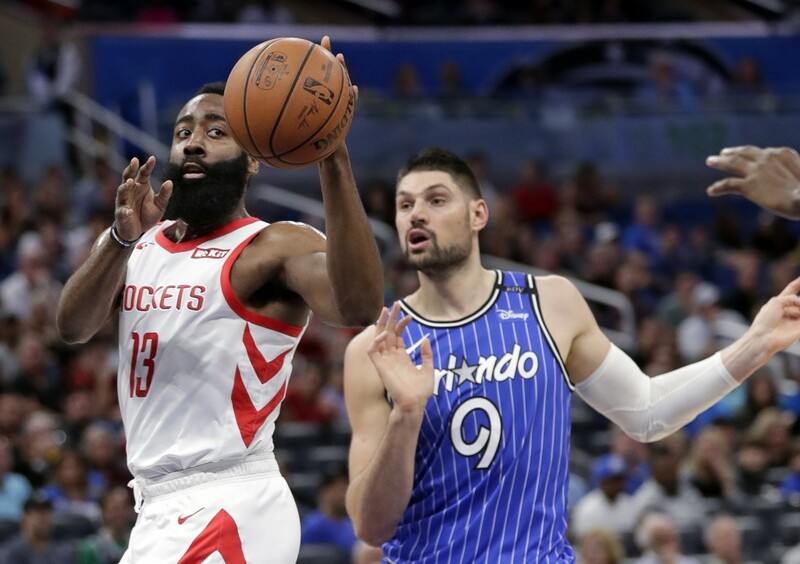 "He's such a good scorer," Orlando's Nikola Vucevic said of Harden. "You have to stay aggressive but you can't foul him. He's going to score. 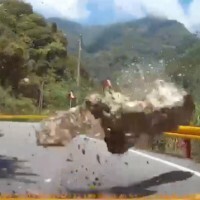 You're not going to stop him. He has the ball so much and they run everything for him." Even on a night where he got almost nothing from deep to fall, Harden's scoring average rose. 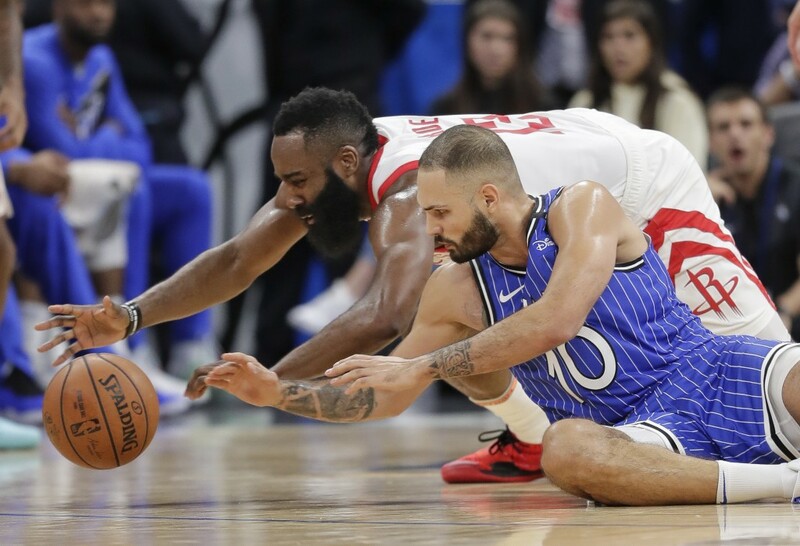 "I thought we did a pretty good job on him," said Orlando's Evan Fournier, who shouldered much of the defensive load against Harden on Sunday night. "And then I looked at the scoreboard and he had 38. He's just unbelievable."